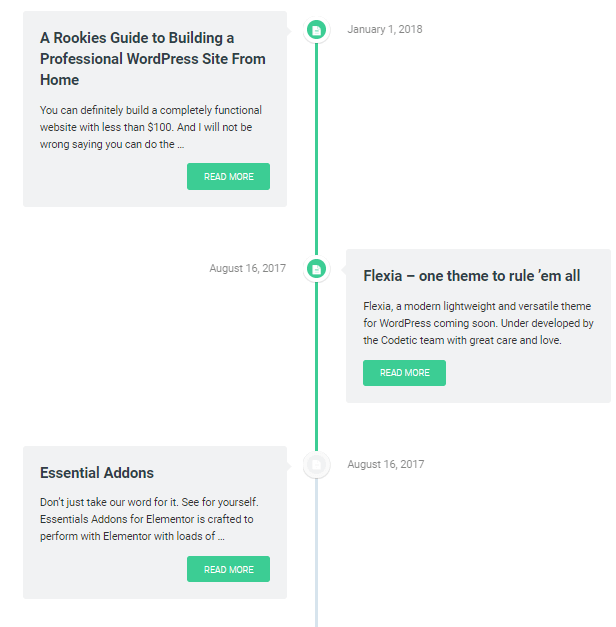 Create an elegant vertical layout for your blogs and posts with Content Timeline element. From the first option between Custom or Dynamic. The custom layout lets you manually pick blogs/posts for the timeline. Whereas the Dynamic layout will automatically fetch published content from your WordPress website. From here you will see the blocks emerging from the timeline as separate entities. Once you click over one of them, you will see more customization options. From here fill up the Title, content, Post Date fields. Choose an image from the drop-down list. And last assign any link to the button. This way you can link actual blogs to the timeline custom blocks. First, choose what type of content you want to include in the timeline-Post or Page. You can further the timeline by picking by category of blogs. Additionally, you can order the posts by date in an ascending or descending order. You will see 5 customization options under this header. Timeline Style– From here you can pick an Active and Inactive color for the timeline. Card Style– From here adjust the padding, margin, radius and box shadow for the cards. Bullet Style– First adjust the bullet size, bullet position, and its border width. Additionally, you can customize the bullets differently for both active and inactive states. Color and Typography– From this option adjust the typography for title, excerpt, and date separately. Read More Style-First adjust the margin and padding for the button. Afterwards, you can adjust the typography and color for its normal and hover state differently. See how beautiful Content Timelines you can build with Essential Addons.